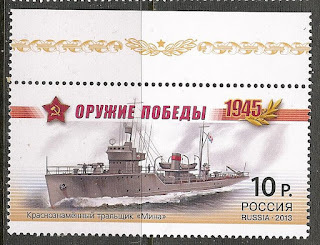 Four ship stamps were issued in 2013 by the Russian Postal Authority to commemorate weapons that helped contribute to the "Russian" victory in WWII. 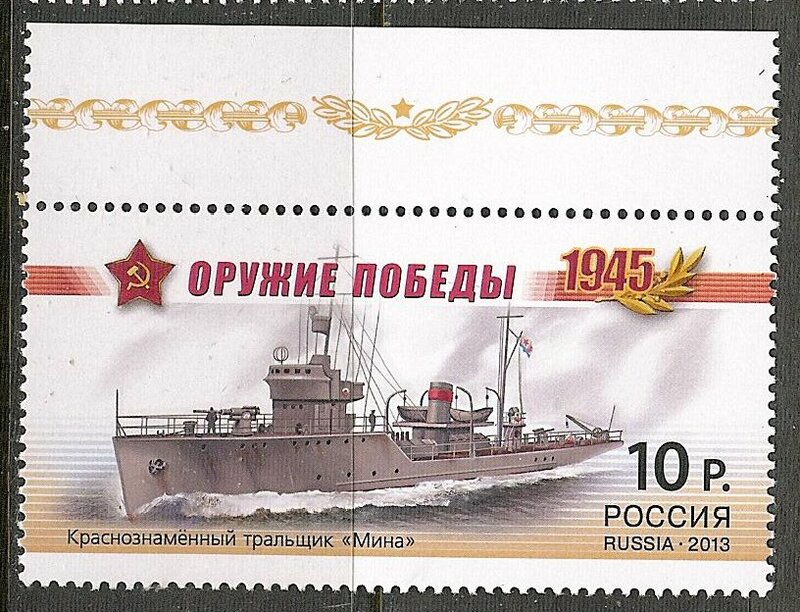 The first stamp in the set depicts the minesweeper Mina. 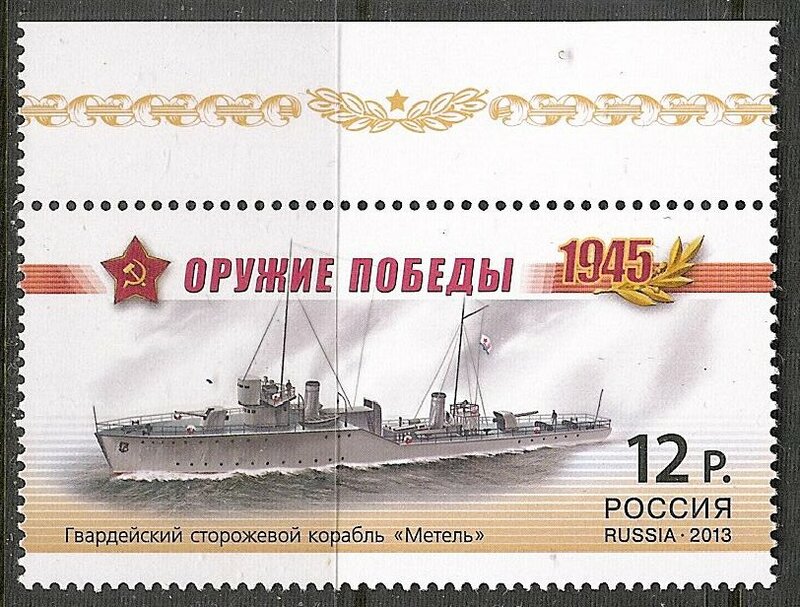 The Mina was built as a fast coastal minesweeper for the Soviet Russian Navy at Sevastopol. Completed in the same year construction started she was launched on August 20, 1937. Displacement 410 ton standard, 503 ton full load. Dim. 62.0 x 7.2 x 2.26m (draught); Powered by two 42-BMRN-6 diesel engines producing 2,000 hp; twin shafts; speed 18.5 knots. 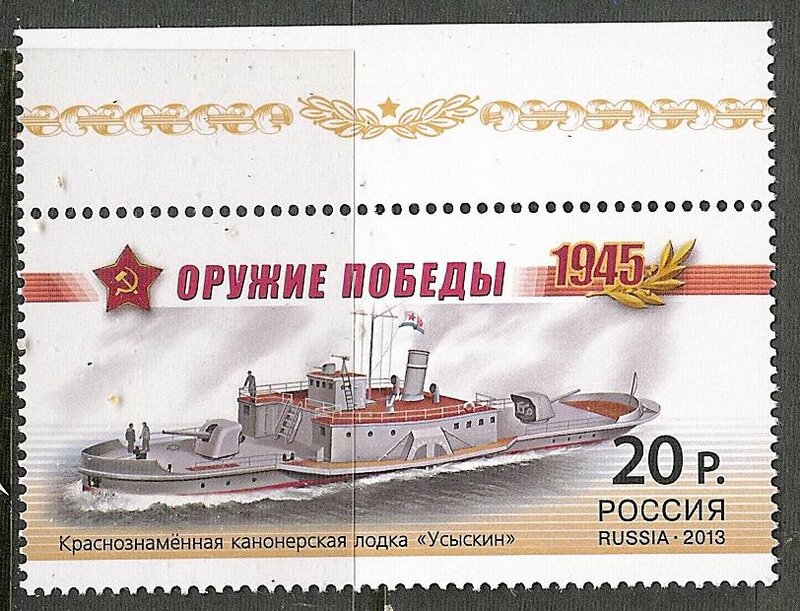 She was delivered to the Russian Navy on August 28, 1938 and served in the Black Sea. Through the four years of WWII, she sailed 47 000 miles through mine infested waters and was responsible for escorting numerous ships. Through her service during the war she had come under air attack no less than 300 times. In July 1944 the Mina was awarded the Order of the Red Banner. 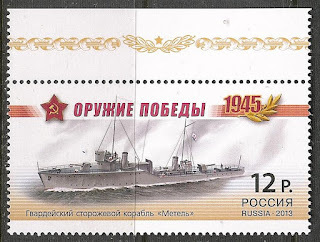 The next stamp features the patrol boat Metel. This ship was constructed in sections that were shipped via train and sent to the Soviet Far East and assembled at the Dalzavod Shipyard in Vladivostok. Displacement 450 ton standard, 530 ton full load, dim. 71.5 x 7.4 x 2.6m. (draught); Powered by Curtiss geared steam turbines, 6,290 hp, speed 24 knots, economical 14 knots; Range by a speed of 14 knots, 1,200 mile. Armament 2 – 102mm; 3 – 37mm guns; and 3 – 12.7mm MG.; 3 – 450mm torpedo tubes; 2 – mortars; carried 48 mines and 30 depth charges. Fitted out with mine sweeping equipment. She had a crew compliment of 108. Throughout WWII the Metel escorted ships through minefields. During the battle of Chongjin, in Northern Korea the ship and crew distinguished themselves through expert fire support shooting down enemy aircraft, destroying an armoured train, taking out enemy coastal batteries and searchlight installations, destroying eight concreted fortifications and gun positions, and causing serious damage to an enemy landing craft. 64 of the Metel's crew were awarded with orders and medals. 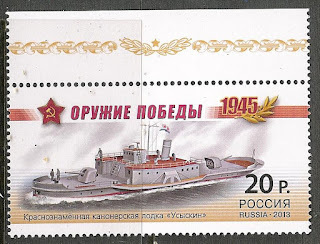 Her Captain was conferred with the title "Hero of the Soviet Union". 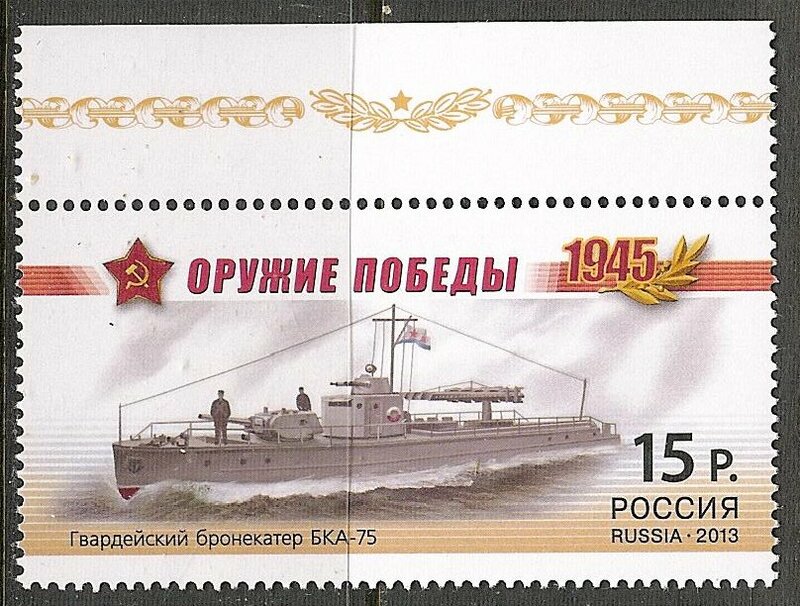 The river armoured craft BKA-75 is the next stamp in the set. She was built at Zelenodolsk and completed in December 1941. Displacement: 49.75 standard, 52.16 full load, dim. 25.3 x 4.04 x 0.87m (draught); Powered by engines of 1,800 hp, maximum speed 37.4 km/h, economical speed 23 km/h; Range up to 680 km. Armament 2 – 76.2mm guns; 2 – 12.7 and 2 – 7.62mm MG. The BKA-75 had a crew 17. Through out WWII BKA-75 served along side Russian army units and participated in the defence of Stalingrad and worked on the Volga river until September 1943 when she was loaded on a rail car and transported to the Azov Sea. After suffering serious damage and repairs she joined the Danube Flotilla where she took part in the liberation of: Romania, Bulgaria, Yugoslavia, Hungary, Czechoslovakia and Austria. She also particpated in the liberation of Belgrade. 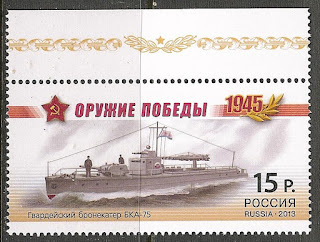 The last stamp in this set displays the gunboat Usyskin. Orinally built as a paddle steamer tug for service on rivers, she was converted to a gun boat in July 1941. One 480 hp steam engine , speed 8.5 knots. Armament: 2 – 45mm guns; 1 – 7.62mm MG. The Usyskin participated in the defence of Stalingrad as a unit in the Volga River Flotilla. In February of 1943 she received the Order of the Red Banner. In April of 1943 the Usyskin was severely damaged as a result of a mine. In July 1943, she was converted back to a tug.